Co-pilot always confirms the runway. Always load all available lateral and vertical guidance. Ask the tower to turn lights up to high intensity. It was a long day of flying. We started in Albuquerque, landed in Dodge City for fuel (and a Dairy Queen stop). Then we continued on to Lawrence, Kansas, where we walked the campus (Kansas State) a little, and had BBQ (sort of required for Kansas). The flight to our last stop, Indianapolis, planned at three hours twenty-five minutes, so we were going to stop near St. Louis for fuel. Once we were aloft and picked up a tail wind, it looked like two hours forty minutes, which was possible (although a stretch) on our fuel. So we decided to press on, which would save us the time of the stop and required minimum ground time. 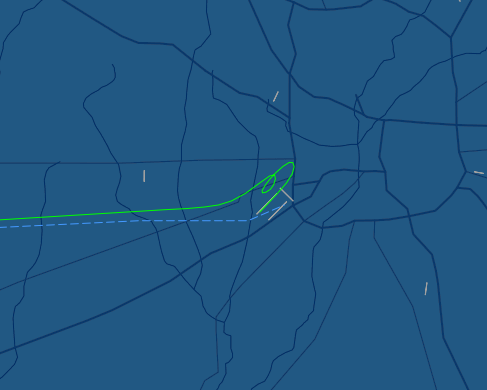 The approach controller told me to expect a right downwind for the visual approach to 23R and had me switch to tower. I noted my runway, ATIS letter and switched to talk to the tower controller. At the other two landings of the day, I had loaded the ILS approach for the airport (actually, I believe Lawrence, Kansas was a GPS approach but it had vertical guidance as well). Nell noticed one of them because the controller asked if I was flying directly to Dodge City or headed to an approach fix. I admitted I was flying the ILS in VFR conditions and he said that was fine. I explained to Nell that out in the middle of the plains there are transmission towers as high as two thousand feet which means that if you descend to the traffic pattern altitude for an airport a little early and your obstacle database isn’t perfectly up-to-date you could end up clipping a tower or, more likely, one of the support cables. That would lead to an accident like this one. So when I am approaching an unfamiliar airport, especially one without a control tower, I follow the instrument approach. That guarantees clearance from terrain and obstacles. For some reason I didn’t load the ILS for runway 23R. That is now a requirement for landing at night. As I approached the airport I was at traffic pattern altitude (a thousand feet above the runway) and talking to the tower controller. He said that there was a Hawker jet on short final for the same runway and that I was cleared to land runway 23R. As I flew downwind for the runway I could see the Hawker landing. When I glanced at my moving map the traffic target was drawn at an offset of the runway (with an altitude tag of -08, showing that the bizjet was 800 feet below me). Instead of showing the traffic target on the runway centerline, it showed it offset to the northwest of the runway, between me and the runway. A moment later I saw the jet had touched down, and it was still drawn a little off of the runway. That’s not unusual, the traffic system doesn’t update perfectly as the plane is maneuvering, and I have learned not to trust it as an exact, real time representation of where other planes are. As we flew abeam the control tower on the far side of the field I scanned the runway environment. That’s usual, because I am often checking to see where the exits are for the taxiway to the FBO and whether there is a displaced threshold for landing. As I did I thought about how with a huge airport like Indianapolis, especially in a place like Indiana where it is easier to sprawl than to build vertically, the huge expanse at night with all of the lights adjacent made it a little difficult to pick out the runway lights. I was looking at a line of closely-space lights in a field of less-closely spaced lights. This was a trick, especially from the side as I was flying past. I glanced inside to check all of my instruments and do my pre-landing checklist (flaps to T/O position, fuel pump on, fuel to fullest tank (and least likely to un-port in the turns to final, I thought for a moment about how little fuel was really sloshing around in the two wing tanks), and propellor full forward). My landing and taxi lights were already on so that I was as easy to pick out of the night sky as possible. I checked my distance to the runway on my moving map and it looked to be about a mile, which is ideal for a 500 foot per minute descent with the power reduced abeam the runway numbers. In those moments of attention inside the aircraft, I lost track of exactly where the runway was. I mean, I knew where it was, it was to my right, in about a mile, and running parallel to me. If I took a photo out the window I could point out the edge lights, but I no longer knew exactly where the touchdown zone was. I knew that when I turned right (base turn) and right again (final) I would line up with the centerline. I would fly over Signature (our FBO) off to my left, and directly over runway 32 which is ninety degrees to 23R. I have landed several times before at KIND, including once at night at the end of a long day. We descended a little, but if I have a longer runway ahead of me, I am likely to stay high. That means I might be high and fast on final, which statistically is the reason people have runway excursion accidents (loss of control after landing), but I only do this when I have quadruple the landing distance we need. I stay high in part because the vast number of engine failures occur on a throttle change, some of those result in an aircraft landing short of the runway. I don’t want to land before getting to the runway. So I don’t touch the throttle when we are taking off until after we are at an altitude to glide back to the airfield, and I don’t pull the power too far back until I can affirm that I can glide to my landing zone. I am motoring along on my base leg, looking into the field of lights for the runway and a little worried I will fly through the centerline before turning final. So I glance at the moving map to check. The moving map in the Diamondstar has a lot of detail. The runway centerlines show up as dotted lines leading to the runways drawn at the airport itself. There are obstacles shown, which turn yellow when they are within a thousand feet of my altitude and red when they are within a hundred feet. (None were depicted yellow or red as I descended.) I have a little arrow telling me the wind direction and little diamond targets representing other airplanes. There is an icon representing my airplane and it has a “noodle.” It used to be a straight line, and the end of the line represented where the plane would be in one minute. A recent software upgrade made it so that the line arcs when I turn the plane, which is what happens in passenger jets. This makes it really easy to turn to converge with a given course. So as I approached the centerline all I did was turn the plane so that the noodle lay us on the dotted line, leveled out and we were flying toward the runway. I looked down but I didn’t see it. There was a parking lot full of little lights, there were a bunch of airport business park buildings with their own lights. I could see the control tower off to the left, but no runway yet. I knew I needed to cross runway 32 first, so I wasn’t worried, it must be off in the distance a little. I continued to slow down and descended a little more. I added the final notch of flaps to slow us down further. Apparently Nell was very worried that she couldn’t see the runway but didn’t want to say anything in the tense moments of landing. She now knows she can speak right up and request a “go around” at any time. No cost in a go around. The tower saw me, off in the distance, hunting for a runway. They said, “Diamondstar one romeo delta, where are you going?” One romeo delta has turned final. “One romeo delta, go around.” I put in the throttle, applied pressure on the stick, and confirmed that I had a positive rate of climb. One romeo delta going around. We thought we were lined up on the centerline for two three right. “One romeo delta, climb.” One romeo delta is climbing. Nell said she didn’t know what I was lined up on either, and later said she was concerned that I wasn’t doing what the tower was asking me to do. I remember pointing to the moving map and saying that according to my GPS we were right on the centerline for the runway. Nell said it had been a long day of flying. There are a lot of accidents where a pilot is lined up for the wrong runway. The Comair accident was one where they took off on the wrong runway. A two-seater version of our plane actually wound up flipped over and slamming into the ground because the pilot misheard the runway assignment (both people walked away from the crash, I love carbon fiber). It is very easy to become disoriented, which is why one of the final checks on both takeoff and landing is to compare the runway number to the heading on the heading indicator and to make sure it is the assigned runway. (That’s why it is written clearly on my kneeboard pad from that evening: two three right.) 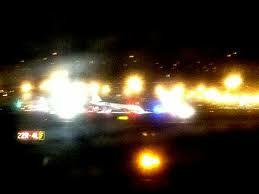 A passenger jet has landed on a taxiway at Newark Airport. So even a professional pilot paired with another professional pilot has landed in the wrong spot at a large airport with multiple runways. We landed uneventfully and took a long time to taxi to the FBO. It’s a big airport. At one point the controller had said I could pull off left on the high speed exit for the runway and she thought he was asking me to pull over so he could send someone out to see if I was drunk. It showed that I needed to talk to my passengers a little more during the landing sequence. The previous night we were landing in Albuquerque with thunderstorms in all quadrants. We had picked our way through a three hundred mile long line of storms to get from Flagstaff to Albuquerque. We probably would have landed in Gallup, New Mexico if not for the assistance of the approach controller in Albuquerque Center helping us around the areas of moderate and heavy precipitation. But with the plane descending on the ILS to runway eight at the Sunport, Nell was on her little MacBook Air and the boys were reading their phones, listening to music, generally awaiting the opening of the doors. Much more tense for the pilot, passengers all blissful. Nell said she was worried at Indianapolis that since I was disoriented we would descend into a parking lot or buildings and hit electrical lines. A few things protected us from such a mishap. The first is that the airport environment, through the regulations of the FAA, is protected. That means that there are no tall obstacles. If there are any within the protected radius they are well-lit as obstacles. The tower knows where they are and will advise you. (In San Diego they have pointed out the parking garage on short final to me.) 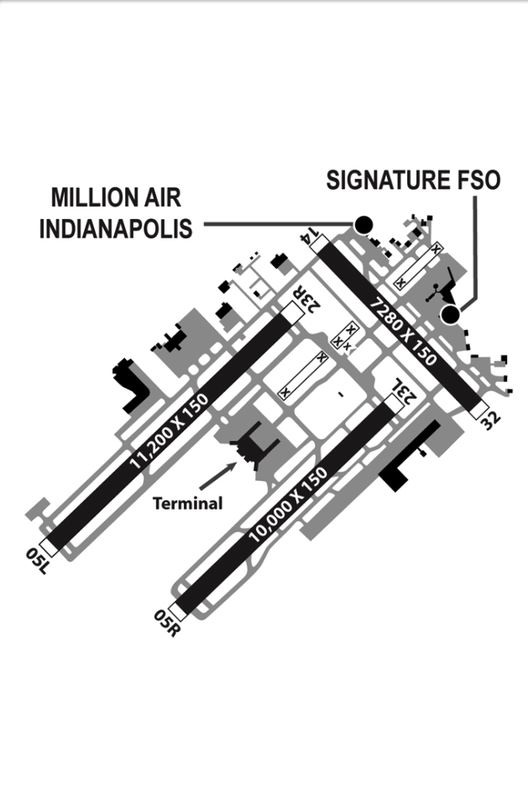 Obstacles are also marked on the airport diagrams and mentioned in the ATIS recording. The second is that I will not actually descend to land until I have identified the runway and confirmed that it is the correct runway. I look up the length and width of the runway on the G1000 (or in Foreflight) before I approach the airport. If there is a 13,000 foot runway (like at Albuquerque’s Sunport), I will most likely be using that. I don’t want to prepare for runway 08 (nice and long) and then wind up landing on runway 12 (not even half as long). I am not sure how the moving map could have been incorrect. Since I was not doing a GPS approach I didn’t check the RAIM to see if there were enough satellites to get a corrected (WAAS) position fix. It sure seems like one of my beloved gizmos lied to me. Not enough to get me in trouble, but enough to give me pause. Nell doesn’t remember looking at the moving map and seeing us lined up on the centerline, so it is possible that I was so disoriented that I misread the moving map entirely. I don’t know how I could do that, think I was seeing the cyan noodle lining up tangentially on the dotted line when it wasn’t, but disorientation and the human mind are capable of tremendously powerful distortions of perception. The old saw is that the regulations of aviation are “written in blood,” the idea being that people died when they didn’t check the oil, so we always check the oil. Some of the rules I have adopted can certainly be thought of that way. Every month I read the NTSB Reporter and I have made rules for our flying based on my reading of that (and the Nall Report). But some of the personal rules, like these three new rules for night landings, I prefer to think of as “written in tense moments.” And I would like it to stay that way. Glad everything worked out, Colin. Long periods of boredom interrupted by brief moments of…well, you know.